While the Avalanche were an out-shot team at 5v5 that outscored due to strong percentages, the Flames were a far more significantly out-shot team where percentages only diminished the bleeding. Colorado out-performed Calgary’s shot metrics in all facets: shot attempts (Corsi), unblocked shot attempts (Fenwick), and shots on goal. Even when trying to account for shot quality, both teams still end up looking below league average. WAR-on-Ice has developed a scoring chance estimate (Chance) which accounts for shot location and estimates whether a shot is from a rebound or a rush play. Weighted shots (wSh) is a shot attempt differential that weighs goals more heavily than non goal shots. 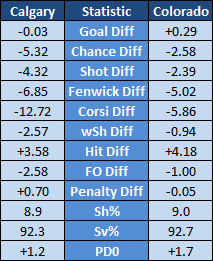 Both teams even performed similarly in hit differentials and face off win/loss differentials. There is one area, though, where Calgary performs adeptly, while Colorado did not. The Flames carried an extremely high penalty differential, the best in the league. If a team draws a lot more penalties than it gets called against it, it will improve its goal differential. Both teams scored at equally efficient rates and prevented goals equally well. However, Calgary performed far better in shot volume on the power play and suppressing shots-against on the penalty kill. While the Flames have a long way to improve at 5v5, their penalty differential — if it is sustained — should still win them some games, even if they are only a middling team in special team situations next year. For fun I thought I’d take a look into this…both teams are young but also have a lot of “quality” young players. I took the age and Goals Above Replacement for every player on the roster that played more than one game. Then, I normalized each team so that the lowest value was +0 GAR. Using this value I took the team’s average age weighted by the percentage of the team’s normalized GAR. Essentially, the larger a player’s impact on GAR, the larger the player’s weighting on the average age. The Calgary Flames made history — they were the lowest regular season shot attempt differential team to make it past the first round of the playoffs. 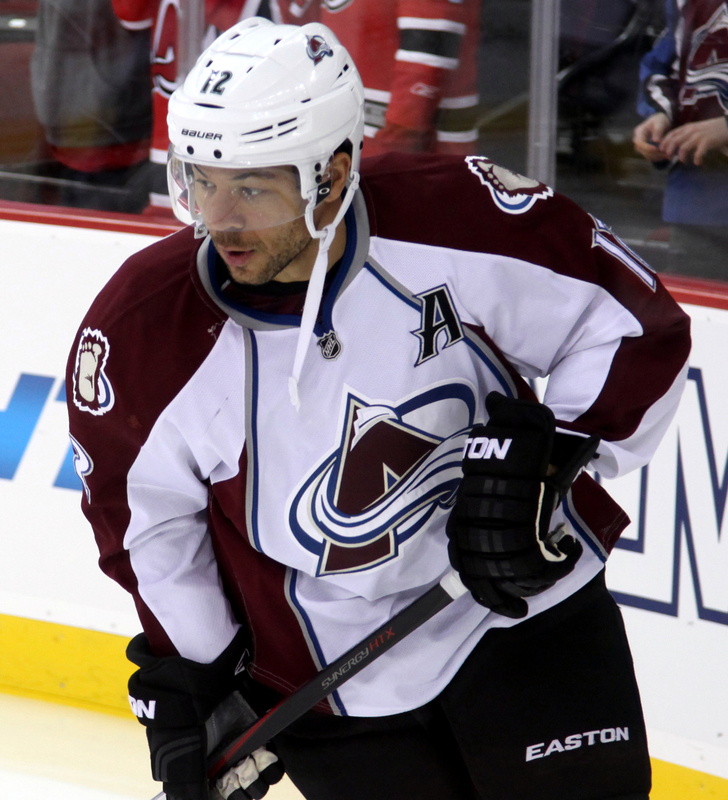 They are a long ways off and it would not be surprising if the team crashes as hard — if not harder — than the Colorado Avalanche, if things do not change for the better. I tweeted out an informal poll, asking if people believed a similar regression for the Flames as the Avs experienced. Most said no, citing stronger defense, a weaker division, and elite defenseman Mark Giordano’s return. However, the Flames had most of those same factors in play this season and the numbers did not smile fondly on them. The Flames do have a lot of cap space. Wise moves could supplant problematic parts of the current team and move them in the right direction — but of course, unwise moves could do the opposite. Which one happens remains to be seen. Interesting piece. One obvious caveat involves defining what would constitute a “crash” by the Flames next season. The 2013-14 Avs dropped from the 3rd best record in the NHL to 21st this season, with 22 fewer points. For all the “miracle season” rhetoric around Calgary this season, a bit of perspective: they finished 16th in the league and didn’t make the playoffs until the last days of the regular season. For them to equal what happened to Colorado (i.e., dropping 22 points, which would leave them with 75), they would need to be one of the worst teams in the NHL next year. I looked at this recently Nick, comparing Flames to other extreme Cinderella teams (about a 45% corsi ratio during the regular season). There was only 3 others, but the average points loss across them was 20 from season 1 to season 2. Lose Stastny (16-30-46 this season) and add Iginla (29-30-59). Seems like that wasn’t the issue to me.